Black jersey quilted shoulder bag with chain featuring a double top flap, outer fastening with a gold-tone interlocking ‘CC’ twist-lock, inner fastening with press stud, zipped pocket under outer top flap, flattened pull-through gold-tone chain shoulder strap, all-over diamond quilting and back slip pocket. 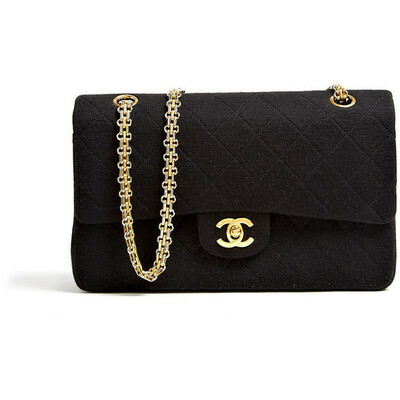 Chanel Vintage bag has a red grosgrain inner lining, a front zipped pocket, interlocking ‘CC’ stitched under top flap, gold -stamped designer name and two interior slip pockets. Vintage Chanel bag measures 25cm x 15cm x 7cm.